I don’t normally make mayonnaise-based potato salads, but I made an exception for this wonderful variation. The richness of the mayonnaise is cut by creme fraiche, and the combination of coriander, lemon, and cider vinegar give it a delicious piquant flavour. With the generous addition of hard-boiled eggs, the salad represents the best of two picnic favourites. 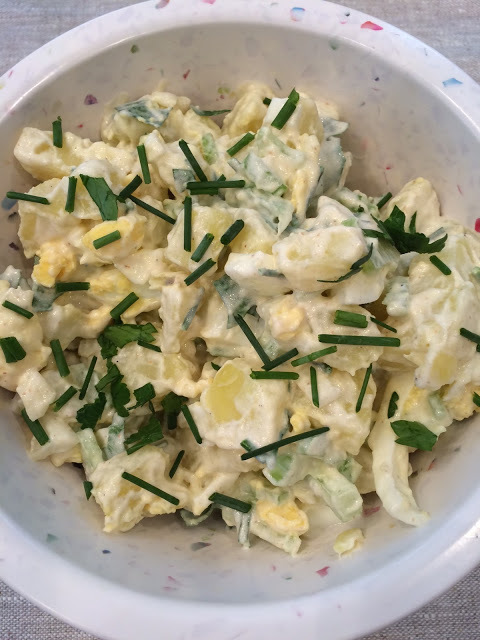 I’m a big fan of cookbook author Susie Middleton, who has never steered me wrong with a recipe, and this classic potato salad is yet another winner. Make this for the next picnic or potluck dinner you’re invited to – and hope it isn’t all gone before you fill your plate! Put the potatoes and 2 tsp salt in a large saucepan and cover with plenty of water. Bring to a boil, reduce to a simmer, and cook until just tender, 10 to 12 minutes. Drain carefully in a colander, rinse briefly with cool water, and spread on a clean dishtowel to cool to room temperature. In a large mixing bowl, whisk together the mayonnaise, crème fraiche, cider vinegar, lemon juice, lemon zest, ground coriander, a pinch of salt, and several grinds of black pepper. Add the cooled potatoes, eggs, celery, onions, most of the parsley, and most of the chives. Sprinkle 1/2 tsp salt over all. Gently mix everything together until well combined, breaking the eggs apart as you mix. Transfer to a serving bowl and garnish with remaining parsley and chives. Serve right away or refrigerate for up to 24 hours. I'm the same with mayo based salads, so if this gets your seal of approval I'll have to try it. I love how you cut the mayo with creme fraiche! It sounds like the perfect picnic recipe (and I'm definitely checking out this cookbook!). Loving this potato salad Beth, so clever to mix mayo and creme fraiche. Looks amazing! I wonder if I could use 100% sour cream here because I am not a fan of mayonnaise at all. The salad does look very satisfying and tasty, Beth. This sounds great with the sour cream addition. I just made a potato salad yesterday – I like the combination of flavours you've got here! 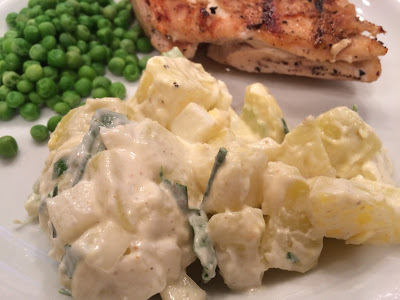 I am also a fan of mayo based potato salad – and this recipe sounds great! love potato salad! this look absolutely yumm!! Beautiful! I love potato salad, unfortunately, hubby doesn't so we hardly ever have it. I'm tho complete opposite. Any time I make potato salad, I make it with mayonnaise. This one looks so good. I need to try it sometime! This says summer to me. The perfect salad for picnics or barbecues and your version sure looks delicious, Beth. Good idea to add creme fraiche to the mayo! What a nice combo. I tend to make mainly vinaigrette-based potato salads these days, but sometimes you just have to do a mayo one! This looks excellent – thanks! Yum – a classic potato salad is the perfect thing for a summer picnic. I love potato salad, but I never make it after some poor attempts in my youth. This looks delicious and I think I should just get over that! I love potato salad every which way. This sounds so good with some new additions I haven't seen before. Can't wait to try it! I love a classic potato salad. I love using crème fraiche in my recipes, and this mayo and crème fraiche combo sounds delightful. Loving it, Beth. Dear Beth, there is no such thing as too many potato salad recipes. I am, of course, rather biased when it comes to potatoa salads – it is one of those dishes we love around here! I love potato salads! I also love adding some yogurt to make the sauce a bit lighter! This sounds like a perfect summer meal! This does sound like another winner from Susie Middleton! Love the additions of coriander and lemon. Can't wait to try it.